BitCoin and Ethereum are one of the most popular cryptocurrencies out there. Bitcoin being first on the run has a massive advantage but Ethereum is not that far behind in the race. There are hundreds of cryptocurrencies available for trade. Get the list of all cryptocurrencies here. If you've seen Bitcoin, Ethereum's upward momentum, together with cryptocurrencies, you've also contemplated getting in on the activity. Thus out of lots of the cryptocurrencies, Ethereum, and Bitcoin, may be a way to transact on the internet. Nevertheless, the rise of cryptocurrencies are a moment for technology, and when you wish to purchase any, it is worth knowing how cryptocurrencies all work. Cryptocurrency will not just appear on your wallet from thin air. There has to be an initial transaction to bring bitcoin into the wallet. There are several ways, but the simplest is to exchange currency dollars, euros or rupees for a few cryptocurrencies to a fiat. Think of these exchanges as a stock market for crypto. The marketplace is still new and it is not bound by the laws and regulations as the stock exchange. So there is a risk and it is a barter trade just like ancient days except that in order to buy cryptocurrencies, regulated and approved money needs to be exchanged. The cryptocurrency markets have matured in latest years, but there is still a lot that may go wrong. There's always the potential for user error that may send out your cryptocurrency. Among the biggest bitcoin exchanges, Mt. Gox, had a number of its bitcoin and it went bankrupt. A crypto market crash due to the security breach at Mr. Gox exchange caused Bitcoin to lose it's 70% of its value. If you're searching for your initial exchange, a great bet is Coinbase, a U.S.-based cryptocurrency exchange with over 8 million users, operating in 32 countries around the world. Then next in the line is Binance. The basic requirement to access cryptocurrency in any wallet is cryptographic key. On crypto exchange accounts, you cannot access your cryptographic keys and hence there less control on any cryptocurrency you've on any crypto exchanges. There are many other exchanges such as Binance, Kraken etc. These exchanges support a larger number of cryptocurrencies. You choose how much money you would like to spend, and which cryptocurrency you would like to purchase. Before you open an account and purchase your first cryptocurrency, you have to think hard and long why you need it, to begin with. All cryptocurrencies are incredibly of value and grow very quickly, but being ready to lose a large proportion that is a risk you have to take if you are intrigued in trading. There are various mobile wallets, like the Coinomi, support a lot of cryptocurrencies. 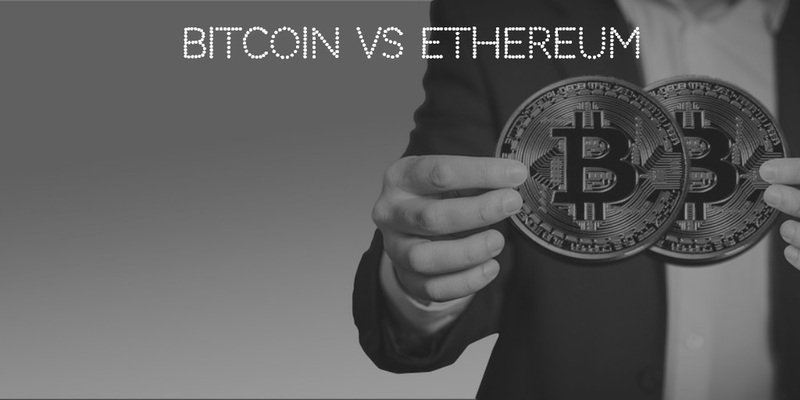 Having said enough about cryptocurrencies lets dive into side by side differences of BitCoin Vs Ethereum. NOTE: The page contents will be progressive in nature. We will update contributor column if there are any distinct corrections/additions notified in comments below. BitCoin rewards are halved every four years. 25 Bitcoin per block; Reward halves every 210,000 blocks. Ethereum rewards 5 ether per mining block. Cost of a transaction is called GAS and depends on storage needs, complexity and bandwidth usage. Are there any distinct differences between BitCoin Vs Ethereum? Notify everyone in comments below and will be updated with contributors name in above table.